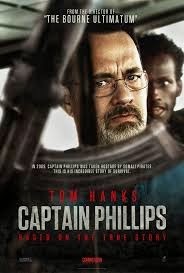 I'm a pretty big fan of Tom Hanks, though I have to admit that I was a somewhat reluctant viewer of Captain Phillips. Given its nautical theme, I can't say it instantly jumped out as something I was desperate to see. That said, there are definitely things which are good about the latest offering from director Paul Greengrass. The film is based on the real life story of Captain Richard Phillips, who was in charge of a US cargo ship, the MV Maersk Alabama in 2009, when the ship was boarded by four Somali pirates. Phillips ultimately got taken hostage in one of the ship's lifeboats. With such dramatic source material, it's hardly surprising that a lot of my enjoyment of the film came from the tension created by this dangerous situation. As the crew hid in the engine room, Captain Phillips worked to prevent the pirates discovering them and taking control of the ship. The handheld camerawork adds to the sense of chaos and unpredictability and as a viewer, it's nail-biting; it's certainly a film which draws you in. What is particularly refreshing about the film though, is the fact that the pirates become somewhat sympathetic characters because at the beginning we witness the poverty which drives them in search of ships to loot. Greengrass does not fall into the trap of making it entirely one-sided. Indeed, as the story progresses, we feel that Somali leader, Muse (Barkhad Abdi) is limited in options, as he references being under the control of a 'boss', and there is a real sense of the vast differences in cultures between he and Phillips. The performances are satisfying, with Hanks and Abdi playing well against one another with energy and variance. It's very much a real life action film, but it's done extremely well. I can see why it has been so well reviewed, and the fact I'm not raving about it has more to do with my personal taste than the quality of the film.